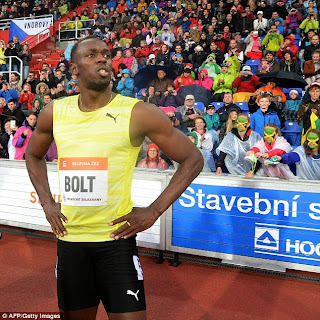 Usain Bolt eased to victory on his first race on European soil this year in the 200 metres at the Golden Spike event in Ostrava in the Czech Republic. The Jamaican lived up to his showbiz reputation as he made light of the greasy conditions and waved to the delighted crowd on his way to the blocks. But after a few moments of levity he was focus personified. The six-times Olympic gold medal winner made a customary slow start, with the American Isiah Young getting the early advantage, but the 28-year-old took complete control round the corner and powered home in 20.13sec. It was the second time Young had finished second behind a Jamaican sprinter after being edged out by Asafa Powell in the 100m earlier on. Like Bolt, Powell did not have the best start but he began to pull away after about 60m to take the victory in 10.04s. Although Powell was unable to add to the 84 times he has broken the 10-second barrier, he will be pleased to have been so close in the wet weather. Young crossed the line in 10.13 while Britain’s Richard Kilty continued his bid to replicate indoor success outdoors by finishing third in 10.31. His fellow Briton James Ellington finished sixth in 10.45, before he returned for the 200m race and was impressive, finishing fourth in running 20.81.